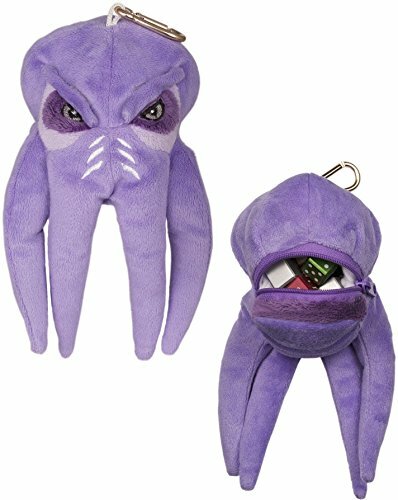 Dungeons & Dragons Mind Flayer Gamer Pouch - Moar Stuff - You don't need it but you know you want it. Draft the psionic powers of your very own Illithid to help keep your dice under total control…. well, its head anyway. This Mind Flayer Gamer Pouch features 4 tentacles, unsettlingly creepy eyes, a carabiner, and a small zippered compartment. The compartment will easily hold a complete set of gaming dice and a mini or two but, it’s not big enough for much else. If you need a lot of dice, give the Bag of Dice Hoarding a shot. I like this pouch despite the fact that I think the eyes are a bit too creepy. Hell, maybe that’s the reason I like it. I have been known to fail will saves when it comes to resisting buying D&D stuff. The carabiner is great for attaching it to my book bag and the Illithid skin is soft and plushy. Well, it might not be real Illithid skin. After all they’re pretty rare here on Earth. Maybe it’s vegan Illithid skin? Dimensions: 7 x 4.5 x 2 inches. Material: Made from Illithid hide which happens to look a lot like a synthetic soft plush material typically made in China.